As an adult, tooth loss can be scary and uncomfortable. Your teeth are precious assets, and losing one can be frustrating, in addition to all of the trauma that accompanies tooth loss. Once you lose a tooth, you may think that you’ll be forced to live a compromised life, working around your complication. However, you don’t have to limit yourself after losing a tooth. There are tooth replacement options that can help you manage your tooth loss, and effectively restore your bite and smile to its original state. It’s simply a matter of taking action and reaching out to your dentist. You may worry that a tooth replacement is only an esthetic fix, and won’t actually solve your missing tooth problems. That’s far from the truth. A dental implant replaces not only the appearance, but also the functionality of your tooth. Implants are surgically placed titanium posts that can actually stabilize your jaw bone. The post functions like the roots of a tooth, holding the replacement firmly in place. Then, your dentist fabricates a crown to set on top of the implant and complete the restoration. You can expect comparable bite strength to your original tooth, and an appearance to match as well. In some cases, your tooth loss may not be limited to just one tooth. You may experience extensive tooth loss if you have a serious accident, or if your mouth has been affected by tooth decay. In these cases, you need a dental prosthetic that allows you to recover on a large scale. 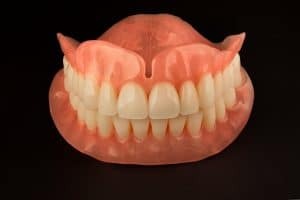 Dentures can replace all of the teeth on a dental ridge with just one prosthetic. Your dentist can also fabricate a partial denture to replace your teeth if you’ve lost many, but not all of them. The denture will match the appearance of your natural teeth. Your dentures won’t be a strong as individual implants would be, but they can be supported by implants in many cases. Losing teeth as an adult isn’t an easy problem to handle. It often comes with a loss of confidence and some pain. Tooth loss does not have to be the end of your story. You deserve to live life with the full use of your teeth! You can eliminate limitations by choosing a dental prosthetic to replace your missing teeth. Dentures and dental implants are excellent options that give you your smile back, and allow you to enjoy your favorite foods again. It’s time to explore your options. Don’t sit back and dwell on your tooth loss, contact Michael Flynn Dentistry! Our compassionate team understands the hardship that tooth loss presents. We’ll work with you to determine the best prosthetic option for your particular situation. Schedule an appointment for a consultation at Michael Flynn Dentistry in West Allis, WI by calling 414-541-8250.